Everybody’s favourite emoticon keyboard for iPhones, Emoji, has been acting up in messages sent between Verizon iPhones and AT&T iPhones. Emoji is a fun-filled Japanese emoticon that was previously only available with App Store apps that unlocked its functionaltity. 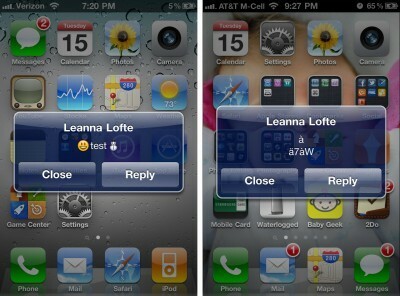 A new finding indicates that when Emoji characters are sent from AT&T iPhones to Verizon iPhones, it works fine but when a Verizon iPhone sends one to an AT&T iPhone, it shows up as strange ASCII characters. This is believed to be a flaw in iOS 4.2.6 (Verizon iPhone firmware) and whether Apple patches it or not in time for iOS 4.3 depends on whether they can find this fast enough. Who knows, maybe this may cause iOS 4.3 to be delayed… again. Verizon iPhone 4 iOS 4.2.6 Still Vulnerable to Limera1n Exploit ?